Street art found in Kakaako. Much of it is completed in an annual one-week festival called Pow! Wow! Hawaii, created by Jasper Wong. Courtesy Timothy A. Schuler. Despite postcard images of palm trees and white-sand beaches, from a planning perspective, Honolulu is not exactly paradise. Traffic congestion is the third worst in the country, behind only Los Angeles and San Francisco. The city has little to no bicycle infrastructure. And though there is a decent bus system, a fraught plan to add a rapid-transit rail line from the suburbs to downtown Honolulu has stalled due to a $910 million shortfall. But Hawaii’s most populous city (population 390,000; about the size of Oakland, California) seems to have embraced a more urban version of itself recently, leapfrogging into the 21st century and welcoming the future of urban planning. The current building boom there—centered on Kakaako, a barren warehouse district between Waikiki and downtown Honolulu—is championing many of the trends that currently guide development in places like New York, San Francisco, and Portland, Oregon—things like walkability, entrepreneurship, and a sharing economy. Parklet in front of Hank’s Haute Dogs in Kakaako. Courtesy Timothy A. Schuler. At one time, Kakaako was home to fish and salt ponds; today it is a mostly treeless grid of single-story warehouses and car dealerships. That is rapidly changing. Dozens of new residential high-rises are currently under construction or being planned, and small businesses—from bike shops to yoga studios—seem to open almost weekly, many of them local entrepreneurs handpicked by developers. In a place that primarily caters to tourism, Kakaako has its hopes set on becoming a “locals-first” destination, with a focus on inclusiveness and affordability, though some residents are nervous about how affordable the neighborhood will remain. 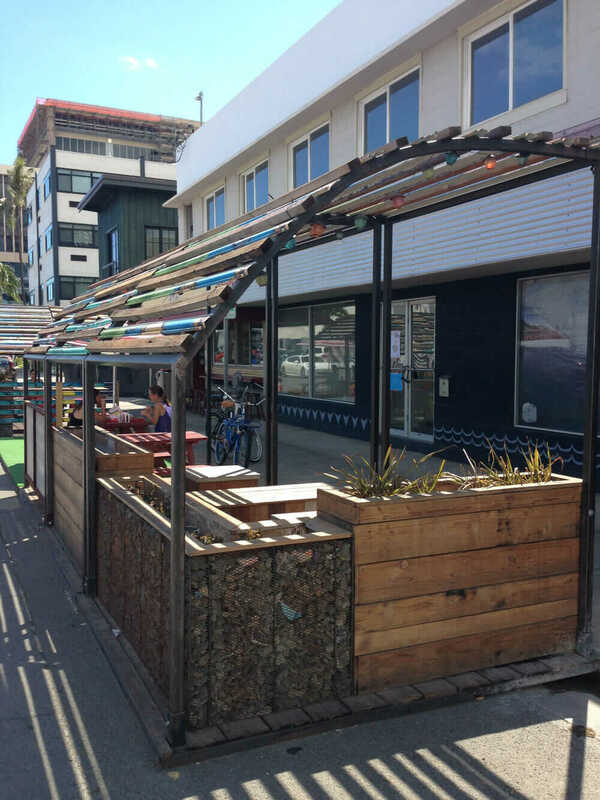 Regardless, from the gabion-walled parklet outside Hank’s Haute Dogs to the artist/fabricator collective Lana Lane, it is immediately clear that this is not the Hawaii of the previous century. Kakaako, rather, is a sign that Honolulu, for the first time in Hawaii’s history, is keeping pace with the rest of the country. And it may be because of social media. Social Takes on a New Meaning. In 2014, Our Kakaako cast a net of free Wi-Fi over its entire 29-acre development and created the #ourkakaako hashtag, maintaining a presence on Twitter, Facebook, and Instagram and encouraging interaction. As it did so, the lines between physical and digital space became blurred. Hashtags were incorporated into murals on warehouse walls, and the Honolulu Night Market, an after-dark street festival, developed an app to share digital updates between monthly events. Kakaako’s local community was quickly augmented by hundreds of thousands of fans and followers from countries around the world. The Internet, especially social media, may be responsible for much of what’s happening in Hawaii, says Wei Fang, a cofounder and director at Interisland Terminal, an arts organization that has had a presence in Kakaako since 2011. “The Internet really has made things feel different here because there isn’t quite the same sense of cultural isolation,” Fang says, explaining that social media has become a conduit for trends in fashion, food, and design. It used to be that newspapers arrived on the islands a day later than the contiguous United States (referred to as “the mainland”). Now, Hawaiians can read headlines at the same time as New Yorkers from the same types of mobile devices and interact on the same digital platforms. Perhaps more importantly, they are using social media to export an image of the islands that is broader and more reflective of Hawaiian culture as it exists today. Peter Apo, a trustee of the Office of Hawaiian Affairs, has been vocal about using social media to create an “online cultural nation” that puts a face on contemporary Hawaii. In many ways, this is what’s happening in Kakaako. The Instagram account of Pow! Wow! 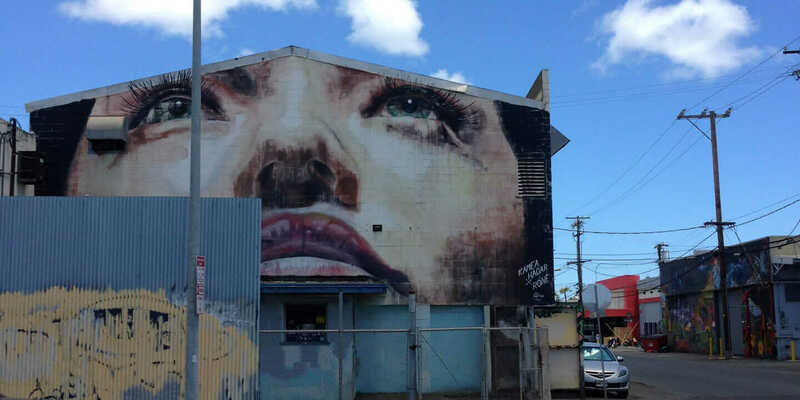 Hawaii, an annual street art festival that takes place in Kakaako, has more than 150,000 followers, and for the first time this year, the group has organized Pow! Wow! Long Beach, a move that in some ways represents a reversal in the historical flow of cultural capital. But Fang says this instantaneous exchange of information and culture is a double-edged sword. Trends from the mainland may arrive more quickly, but this could prevent Hawaii-specific approaches to urban design. “Everyone’s just doing the same thing that’s reflected back to them on social media,” she says. And if a shortening of distances means a flattening of culture, Hawaii isn’t the only place that stands to lose. Before and after for SALT. Courtesy Our Kakaako. Keeping It Local With a Global Audience. 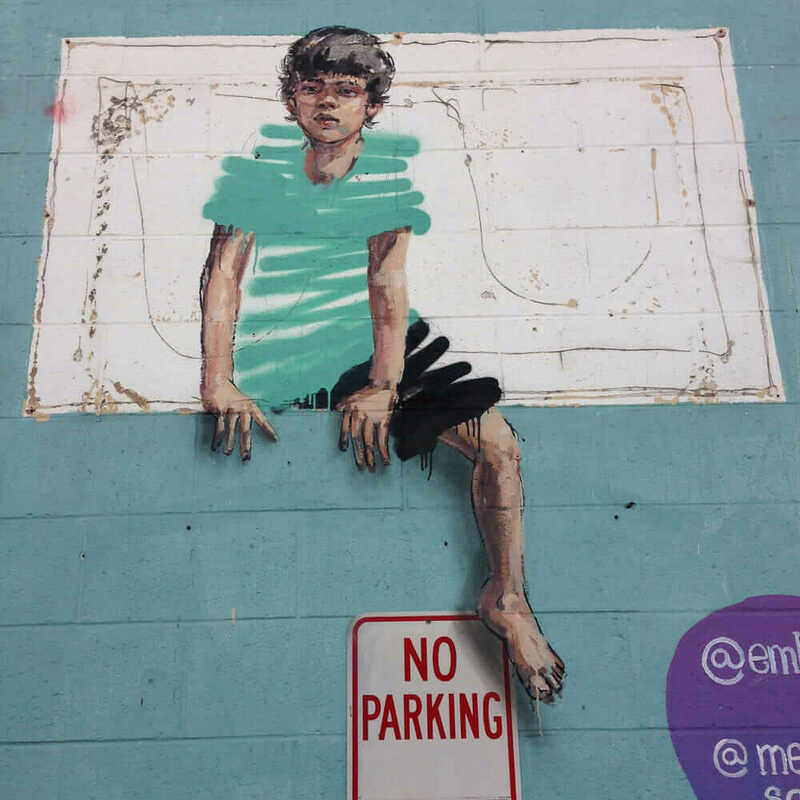 Our Kakaako seems to be trying to find the balance between “placemaking” as prescribed by mainland developers and an authentic expression of Hawaiian history and culture. 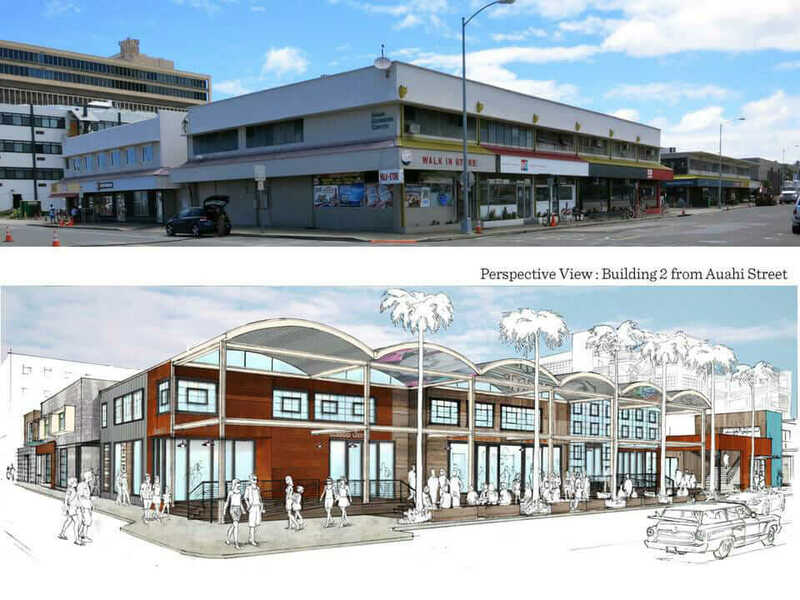 In April, Kamehameha Schools issued an RFP for 12 site-specific works of art that “creatively tell the neighborhood’s cultural and historical stories,” which will be installed in the public spaces of SALT, an 85,000-square-foot mix of new and existing buildings that is becoming a pedestrian-friendly maze of waterfront restaurants, open-air plazas, and retail and residential space. Designed by Atelier Bow-Wow for Interisland Terminal, Kakaako Agora is an open-air (but roofed) space for film screenings and other cultural events. Courtesy Mariko Reed. 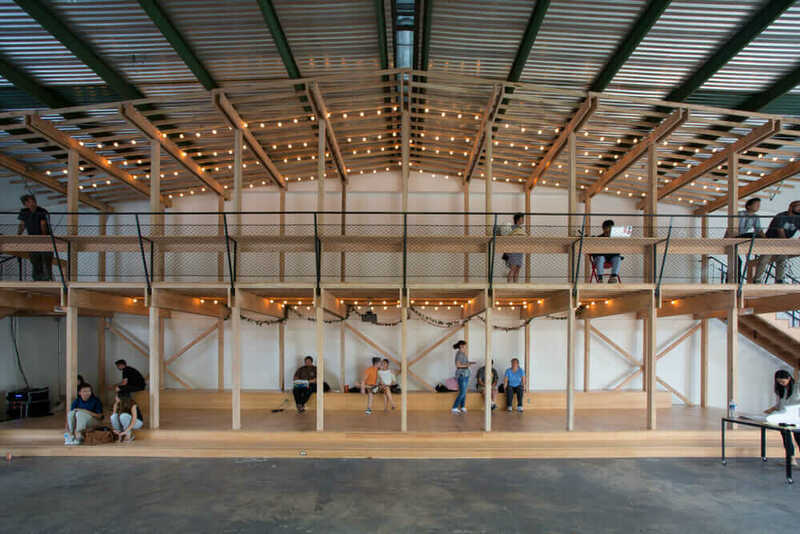 With Interisland, Fang also hopes to inspire a local dialogue around art and architecture through Kakaako Agora, an open-air events space designed by Japan’s Atelier Bow-Wow. The Agora hosts discussions, workshops, and film screenings, among other things, and it’s one of several smaller-scale interventions that are finding homes (albeit temporary ones) among the 40-plus-story condominium towers being constructed throughout the neighborhood.